Have you ever been walking through an attic or a basement in the dark when a sticky spider web brushes across your face? It’s a feeling like none other—surprise, disgust, terror and panic, mixed into a horrible cocktail. Remember how you swiped at your face in a blind panic as you tried to pull the gauzy net off you before the real horror—the spiders!—arrived? Because if there’s one thing worse than a spider web on your face, it’s a spider on your face. Even as you read this, you’re probably shuddering at the recollection. 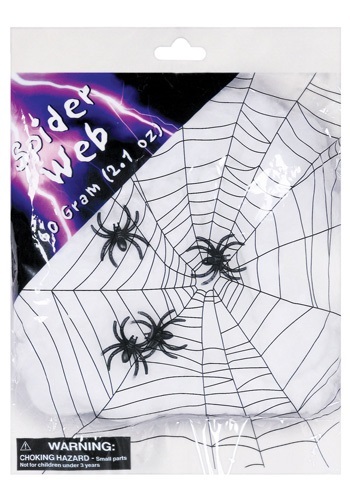 Now, you can share that delightfully terrifying sensation with all your friends at your next “haunted house” party, thanks to our Spooky Spiderweb with Spiders decoration. The stretchy web netting can wrap around anything from bushes to lampshades, and it comes with four black plastic spiders to really sell the illusion. We know your friends will just love walking into one of these by accident!